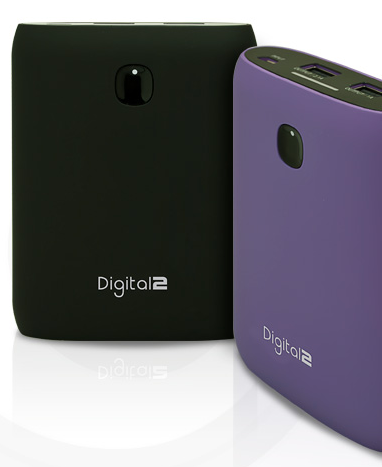 In addition to the family of tablets, Digital2 has released a portable battery pack that can help to keep those devices charged while on the go. This portable battery is power packed, carrying an 8800 mAh charge. Even though it’s a little bigger than a less powerful charger (larger than the average smartphone and a bit thicker) the capacity allows for at least 3 recharges of a phone, and more than 1 for a tablet. Even better, it has a 1A and 2.1A output port so that two devices can be charged simultaneously. On the front of the pack there’s a small button that, when pressed, will light up the LED indicator to show the charge left on the unit. Luckily, the unit will shut off after it completes charging the device, or is unused for a while. This helps to make sure that the pack doesn’t lose its charge unnecessarily. The packs come in bright colors, with a smooth matte plastic finish. Included in the box is a quick guide that provides charging instructions, the unit itself, and a small USB to Micro USB cord that works for both charging the unit and connecting the unit to devices for charging. Because of the size, the pack takes a bit longer to completely charge; we estimated around 5-6 hours for a complete charge. So we left it charging overnight, then were able to carry it for the whole day for charging up a smartphone and tablet, each once, still with a bit of charge left over. This pack definitely packs a punch. Even though it is a bit larger, and isn’t pocket sized, it is especially useful for recharging larger devices like tablets. This may not be the charger that we would carry around if only needing to charge a small mobile device. However, if we were carrying a larger device, the size of the pack would not be an inconvenience.